By Thomas C. Chidsey, Jr.
On September 20, 2001, the U.S. Department of Energy (DOE) awarded funding to the Utah Geological Survey (UGS) as part of its PUMP II (Preferred Upstream Management Practices) technology program, which is designed to compile and disseminate oil reservoir data and best methods for production. The overall goal of the program is to stop the decline in domestic oil production by 2005. The total cost of this new two-year UGS project, titled “Major Oil Plays of Utah and Vicinity,” will be about $351,000 with 50 percent cost share from the DOE. The PUMP program is particularly important for the small, independent operators who drill many of the oil wells in Utah. These companies typically do not have the staff or financial resources to compile and assess oil field data, producing trends, or state-of-the-art drilling technologies that the UGS project will provide. 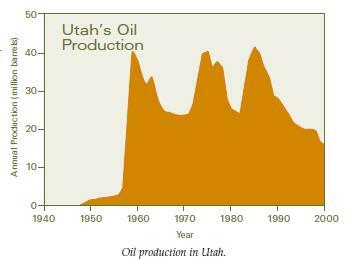 Utah oil fields have produced a total of 1.2 billion barrels. However, the 15 million barrels of oil production in 2000 was the lowest level in over 40 years and continued the steady decline that began in the mid-1980s. The UGS believes this trend can be reversed with the help of this new project. The overall objectives of the study are to: (1) increase recoverable oil from existing field reservoirs, (2) add new discoveries, (3) prevent premature abandonment of numerous small fields, (4) increase oil deliverability through identifying the latest drilling, completion, and secondary/tertiary techniques (injection of water or gas to flush remaining oil out of the rock after initial production rate has significantly declined), and (5) reduce development costs and risks. These objectives will be achieved by providing the petroleum industry with comprehensive play portfolios for the major oil-producing provinces (thrust belt, Uinta Basin, and Paradox Basin) in Utah and adjacent areas. Oil plays are geographic areas having petroleum potential caused by favorable combinations of source rock (rocks rich in organic matter from which oil is generated), oil migration paths, reservoir rock characteristics (such as the amount of pore space available to store oil), and other factors. The play portfolios will include: descriptions of reservoir characteristics such as strata present and the environment in which they were deposited, alteration of rocks, folding or faulting of the strata, trap type, seal, and hydrocarbon source, and maps of the major oil plays by reservoir; production and reservoir data; case-study field evaluations; summaries of the state-of-the-art drilling, completion, and secondary/tertiary techniques for each play; locations of major oil pipelines; description of reservoir outcrop analogs for each play; and identification and discussion of land-use constraints. All play maps, reports, databases, and other information produced during the project will be published in either an interactive, menu-driven digital (web-based and compact disc) or hard copy format by the UGS and presented to the petroleum industry through a proven technology transfer plan. The technology transfer plan includes a Technical Advisory Board composed of industry representatives operating in Utah and a Stake Holders Board composed of representatives of state and federal government agencies, and groups with a financial interest in the study area. The project will be completed in mid-2004. Glad You Asked: How Do Geologists Know How Old a Rock Is?